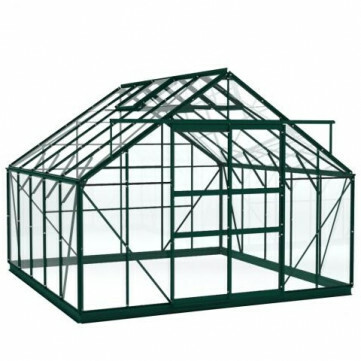 This Simplicity Shrewsbury greenhouse is relatively simple to construct using the comprehensive instructions which have excellent illustrations. Fast UK customer support is available should you have any problems. This greenhouse is supplied as a self-assembly product. Glazing - Horticultural Glass is the standard glazing material used for glazing greenhouses, although many customers now choose to have Long Pane Toughened Glass which is about 8x stronger, and comes in large panes so there are no overlaps (this also looks nicer). Toughened Glass is very strong and shatters into tiny fragments rather than dangerous shards like Horticultural Glass. When glazing with Toughened Glass you can install optional Bar Capping to secure the glass in place - instead of using the stainless steel glass clips, you clip these PVC strips into place. On Silver greenhouses, bar capping is supplied in White, and on Green greenhouses, bar capping is Green to match the frame. The most popular accessories available for this greenhouse are Rainwater Downpipes and Automatic Vent Openers, which you can find by clicking on the highlighted words. To get the most out of your Shrewsbury greenhouse we have a range of Greenhouse Shelves and Greenhouse Staging available too. To help prevent plant diseases due to stagnant air, we also suggest the addition of Louvre Window Vents, which are normally fitted in the back end of the greenhouse, helping to create airflow from the bottom of the greehouse through to the top vents. DELIVERY - This greenhouse is delivered directly from the factory within 3-5 weeks. Delivery is FREE to most Mainland UK addresses. Delivery to Northern Ireland costs £150. Delivery to Isle of Wight costs £80. Unfortunately we're unable to delver this greenhouse to any other offshore addresses. We cannot deliver to transport companies for onward shipping to offshore locations without levying a packing charge for the crating of the glass.